01 November: KZN Philharmonic Orchestra World Summer Series will showcase two iconic works conduced by Tibor Boganyi. The shows starts at 7.30pm at Durban City Hall. Tickets cost from R42 - R189 per person. Find out more here. 01 November - 02 November: The FNB Whiskey Live Festival showcases more than 180 local and international whiskies, liquors and new releases to the SA Market, as well a range of luxury lifestyle products. It's the largest festival of its kind in the world. Tickets are R185 - R465 per person and the festival is from 6pm - 10pm daily. Find out more here. 02 November - 04 November: The Durban Motor Show is here for three days and is filled with live entertainment, exhibitions and activities for teens. The motor show takes place at the Durban Exhibition Centre in Walnut Road and costs R40 - R70 per person. Find out more here. 03 November: Durbanites are spoilt for choice with several craft and food markets happening on this Saturday. Head on to the I heart Market, The Litchi Orchard or Button Up at The Factory Cafe. Click on the links to find out more. 10 November: If you've read the book (we still haven't) then the 50 Shades of Grey Event will have your curiosity peaking. The event will screen an E.L James' interview and have a host of cocktails, snacks and advice from a leading sexologist. You can also shop for "all things sensual" in the Red Room (apparently recreated from the book) of Retail. Each guest will receive a free gift. The event starts at 7pm and tickets are R450 - R850 per person. Find out more here. 13 November - 17 November: The annual adult pantomime brought to you by Suncoast Casino is the Wizard of Oz this year and promises to be a lot of fun. The show starts at 7.30pm and tickets range from R110 - R200 per person. Find out more here. 16 November - 18 November: The Bierfest at Suncoast Casino is housed in 2500 seater Bavarian Brahaus adorned with authentic decor and will boast three Bavarian-styled beers crafted by brew masters from The South African Breweries. Expect Oompah bands and loads of competitions. Tickets are R70 per person. Find out more here. 21 November - 25 November: Join Linda Vargas and her Flamenco Dance Company and guitaist, Demi Fernandez for a night of Flamenco music and dancing. The tickets are only R100 per person. Find out more here. 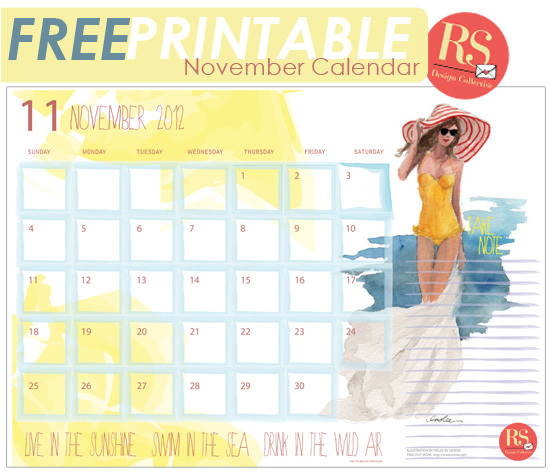 Calendar originally designed by Ruby and the Swallow and is for personal use only. Illustration is copyrighted to Inslee by Design. No replication for sale is permitted.